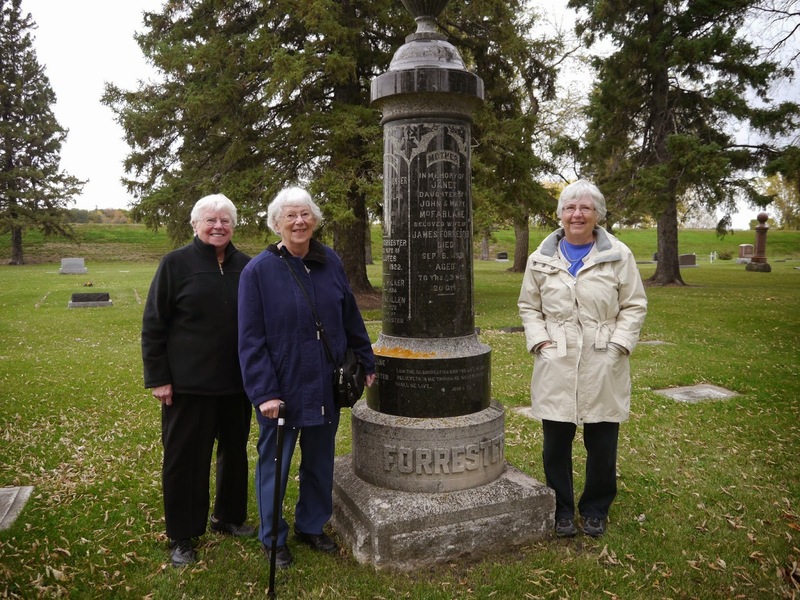 Ruth Breckman, her sister Jean Hewko, and recently discovered cousin Janice Hamilton (that's me) visit the Forrester family plot in Emerson cemetery, Manitoba. A few years ago, I was telling someone at the Quebec Family History Society library about the research I was doing on my Forrester ancestors. Someone else overheard me and asked, “Is that the Forresters of Manitoba?” Indeed it was! She told me that she had met a nice woman at a genealogy conference some years before who was also researching that family. She put me in touch with Ruth Breckman, who turned out to be a distant cousin. Last fall, my husband and I visited Winnipeg, Manitoba. Ruth and her sister took us to the Aux Marais district, about 45 minutes south of the city, to visit the old Forrester farm. That was where Ruth grew up, and where my father’s mother, Lillian Forrester, spent her childhood. Lillian was born near Belleville, Ontario in 1880. When she was about a year old, her grandparents, parents and most of her aunts and uncles moved west, along with thousands of other settlers. There, Lillian grew up on a prairie grain farm. As a young adult, she taught school for a year, then moved to Winnipeg to study nursing. In 1906, she married Dr. Thomas Glendenning Hamilton, and she spent the rest of her life in that city. Lillian was not the only Forrester to leave the farm. Lillian’s parents, Jack and Mattie, retired in California, her uncle David became a lawyer in the nearby town of Emerson, uncle Don was a land developer, her aunt Jenny lived in Minnesota and uncle Jim also eventually moved to Winnipeg. Only her uncle William’s family kept on farming in the Aux Marais district, and Ruth is one of his descendants. During our day-long excursion, Ruth showed us where the old one-room Marais schoolhouse used to be, and the historic community center. We crossed the Marais River, an apt name for a waterway that is more a marsh than a river. She also took us to Emerson Cemetery where my great-great grandparents (and her great-grandparents) Janet and James Forrester are buried. Emerson was a boom town in the early 1880s. Located on the banks of the Red River and adjacent to the United States border, it was on the only rail line connecting eastern Canada with the prairies, a line that went through the U.S. When the Canadian Pacific Railroad completed the transcontinental railroad through Winnipeg in 1885, Emerson quickly declined. Today, just a few grand buildings remain, hinting at the town’s promising past. 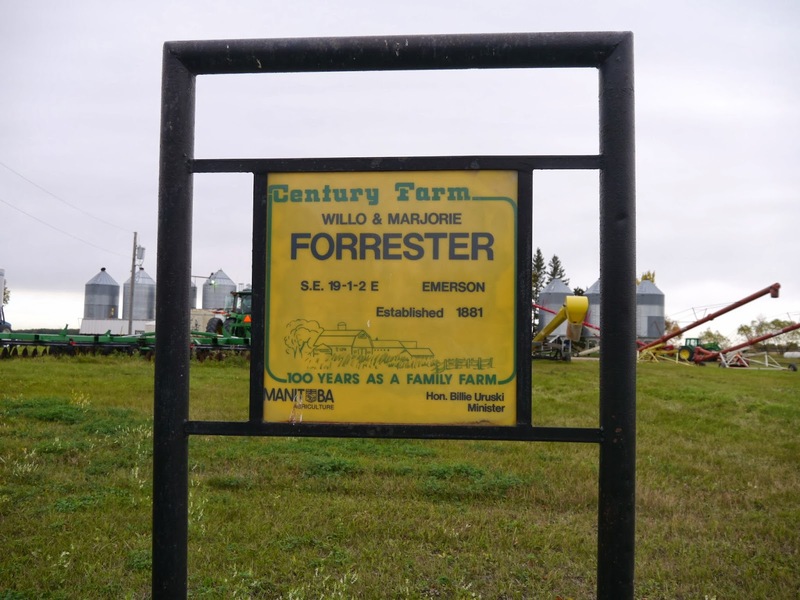 Members of the Forrester family still run the family farm. After lunch, Ruth took us to visit the farm where the current generation of Forresters grow corn, beans and other crops. The 3,000-acre farm they operate today includes the same four quarters, or 640 acres, that James and Janet Forrester and their sons purchased more than 130 years ago. They will most likely be the last members of the family on the farm. Research Remarks: The Manitoba Historical Society website, http://www.mhs.mb.ca, has links to a number of resources, including photos, maps and articles, as well as links to other historical and genealogical organizations, museums and archives in the province. The society’s list of Memorable Manitobans includes several members of the Forrester family, and there is an article about Emerson at http://www.mhs.mb.ca/docs/mb_history/30/emersontour.shtml.